I’m preparing to speak at a women’s retreat this weekend, so no new lesson in our Ruth Bible study this week. Use this week to catch up, or enjoy this Wednesday’s Word lesson from May 27, 2015 as a supplement to our current study. In the days when the judges ruled there was a famine in the land, and a man of Bethlehem in Judah went to sojourn in the country of Moab, he and his wife and his two sons. 2 The name of the man was Elimelech and the name of his wife Naomi, and the names of his two sons were Mahlon and Chilion. They were Ephrathites from Bethlehem in Judah. They went into the country of Moab and remained there. 3 But Elimelech, the husband of Naomi, died, and she was left with her two sons. 4 These took Moabite wives; the name of the one was Orpah and the name of the other Ruth. They lived there about ten years, 5 and both Mahlon and Chilion died, so that the woman was left without her two sons and her husband. 6 Then she arose with her daughters-in-law to return from the country of Moab, for she had heard in the fields of Moab that the Lord had visited his people and given them food. 7 So she set out from the place where she was with her two daughters-in-law, and they went on the way to return to the land of Judah. 8 But Naomi said to her two daughters-in-law, “Go, return each of you to her mother’s house. May the Lord deal kindly with you, as you have dealt with the dead and with me. 9 The Lord grant that you may find rest, each of you in the house of her husband!” Then she kissed them, and they lifted up their voices and wept. 10 And they said to her, “No, we will return with you to your people.” 11 But Naomi said, “Turn back, my daughters; why will you go with me? Have I yet sons in my womb that they may become your husbands? 12 Turn back, my daughters; go your way, for I am too old to have a husband. If I should say I have hope, even if I should have a husband this night and should bear sons, 13 would you therefore wait till they were grown? Would you therefore refrain from marrying? No, my daughters, for it is exceedingly bitter to me for your sake that the hand of the Lord has gone out against me.”14 Then they lifted up their voices and wept again. And Orpah kissed her mother-in-law, but Ruth clung to her. 15 And she said, “See, your sister-in-law has gone back to her people and to her gods; return after your sister-in-law.” 16 But Ruth said, “Do not urge me to leave you or to return from following you. For where you go I will go, and where you lodge I will lodge. Your people shall be my people, and your God my God. 17 Where you die I will die, and there will I be buried. May the Lord do so to me and more also if anything but death parts me from you.” 18 And when Naomi saw that she was determined to go with her, she said no more. 22 So Naomi returned, and Ruth the Moabite her daughter-in-law with her, who returned from the country of Moab. And they came to Bethlehem at the beginning of barley harvest. 1. Why did God include Ruth’s story in the Bible? Why would God allow a Moabite, who was not one of His chosen people of Israel, to have this position or be included in this way? 2. According to verse 5, what losses had Naomi suffered? Why did she encourage Ruth and Orpah to return home to Moab? (11-13) What does this tell us about Naomi’s character? 3. 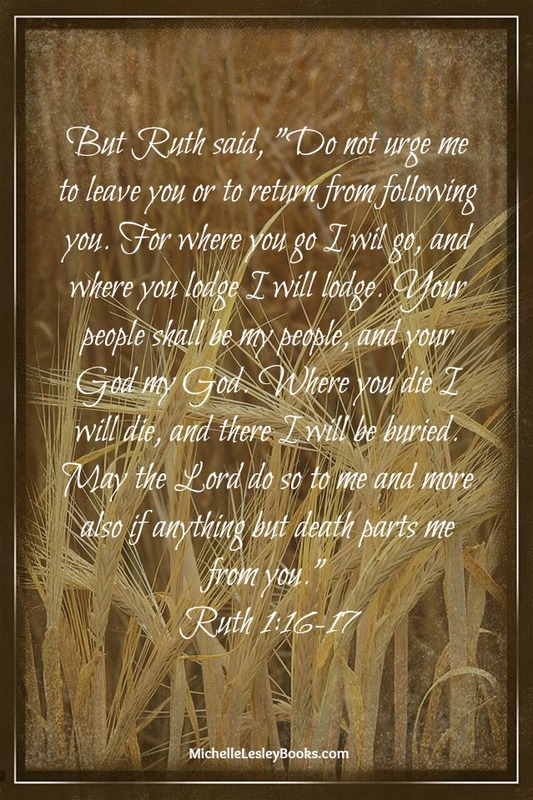 What do verses 16-17 show us about Ruth’s character and faith? Are these traits present in your own life and walk with the Lord? What are some strengths can you thank God for and some weaknesses you can ask Him to help you with? 4. In verses 13 and 20-21, how did Naomi respond to the loss of her husband and sons? Where does she lay the blame for her losses? Compare Naomi’s response to tragedy to Job’s response. How does God want believers to respond to tragedy? Do you need to repent for being bitter over, or blaming God for any tragedies in your own life? 5. Had God really abandoned Naomi, or was this just her own perception? If Naomi were your Christian friend, what Scriptures would you offer her as comfort? What’s Next on Wednesday’s Word? Tomorrow we’ll be finishing up our study of the book of Ezra on Wednesday’s Word, so starting next week, September 7, it’s on to something new! What would you like to study? 1. We could continue on to Nehemiah and finish the current storyline. 2. We could do another Old Testament or New Testament book. 3. We could do a topical study on something like prayer, the Fruit of the Spirit, a particular Bible character, etc. So, let’s hear it. What would you like to study next on Wednesday’s Word? Comment below with your thoughts. 1. What is the theme or purpose of the book of Zechariah? Which other Old Testament, post-exilic prophet was a contemporary of Zechariah’s? What is the historical backdrop for the book of Zechariah? 2. What is the “weeping and abstaining in the fifth month” referred to by Sharezer and Regem-melech? (2-5) Instead of saying, “Yes, keep the fast,” or “No, forego the fast,” what does God say instead? (4-7) During the seventy years of exile, were the people keeping the fast out of love and reverence for God or simply as a self-pitying ritual? (5-6) Which is more important to God, the outward actions of obedience, or obedience from a heart of love for Him? 3. Examine your motives for going to church, worship, serving others, giving offerings, studying your Bible, and praying. Do you do these things out of rote obedience or because you love God? Pray and ask God to change your change your heart in any area in which you are not acting out of love for Him. 5. Why did God have Zechariah tell the people about Israel’s past disobedience and His punishment of that disobedience? (11-14) What can we, as Christians learn from this passage about the importance God places on obedience from the heart? Though verses 9-10 were written specifically to Israel, does God want Christians to carry out these same principles? How do you know? What are some examples of ways you can carry out the spirit of God’s instructions in verses 9-10? In the second year of Darius the king, in the sixth month, on the first day of the month, the word of the Lord came by the hand of Haggai the prophet to Zerubbabel the son of Shealtiel, governor of Judah, and to Joshua the son of Jehozadak, the high priest: 2 “Thus says the Lord of hosts: These people say the time has not yet come to rebuild the house of the Lord.” 3 Then the word of the Lord came by the hand of Haggai the prophet, 4 “Is it a time for you yourselves to dwell in your paneled houses, while this house lies in ruins? 5 Now, therefore, thus says the Lord of hosts: Consider your ways. 6 You have sown much, and harvested little. You eat, but you never have enough; you drink, but you never have your fill. You clothe yourselves, but no one is warm. And he who earns wages does so to put them into a bag with holes. 12 Then Zerubbabel the son of Shealtiel, and Joshua the son of Jehozadak, the high priest, with all the remnant of the people, obeyed the voice of the Lord their God, and the words of Haggai the prophet, as the Lord their God had sent him. And the people feared the Lord. 13 Then Haggai, the messenger of the Lord, spoke to the people with the Lord‘s message, “I am with you, declares the Lord.” 14 And the Lord stirred up the spirit of Zerubbabel the son of Shealtiel, governor of Judah, and the spirit of Joshua the son of Jehozadak, the high priest, and the spirit of all the remnant of the people. And they came andworked on the house of the Lord of hosts, their God, 15 on the twenty-fourth day of the month, in the sixth month, in the second year of Darius the king. 1. What is the purpose of the book of Haggai? Which genre(s) of biblical literature (prophecy, epistle, narrative, wisdom, etc.) is the book of Haggai? What is the historical backdrop for this book? 3. List the negative consequences the people experienced for neglecting to rebuild the temple. (6,9,10-11) What reason did God give for sending these negative consequences (9), and what was their intended purpose? What does God mean when He says, “Consider your ways,” in verse 5? In verse 7? 4. What were the two ways the people responded to the prophecy? (12) What were the two ways God responded back to them? (13-14) How is this similar to God’s response to our repentance? How would the words “restoration” and “reconciliation” apply in both this passage and in our repentance today? 5. What does this passage teach us about prioritizing our relationship with Christ, and our obedience to His word, above all other temporal concerns and activities? What can we learn about the negative consequences of sin? Has God ever used the negative consequences of sin to get your attention and draw you to repentance? What is God’s response to our repentance and obedience? Your input needed for the next phase of Wednesday’s Word. If you follow my Wednesday Bible Study on the blog (Wednesday’s Word), you may have noticed that, for the past year or so, I’ve been working my way through every book of the Bible, choosing a chapter from a different book each week. To make sure readers got a taste of every single book of Scripture in hopes that you would discover a book you’d never given much thought to, and study it. To demonstrate that every single book of Scripture is valuable and worth studying. To encourage readers to delve more into the Old Testament in order to beef up familiarity with the broad overview of Scripture. We’re just about to finish up this arc of Wednesday’s Word, and, starting June 1, it’s on to something new! We’re going to begin a study of a single book of Scripture, starting at the beginning and working our way through to the end. The only question is, which book will we study? The answer: You tell me! I’ve already written studies on Jonah and 1 John. I’ve already covered all the “one chapter” books (Jude, Philemon, Obadiah, 2&3 John) during the last year of Wednesday’s Word. I’d like to stay away from Daniel and Revelation for now. And, if we’re going to do a numbered book (Kings, Timothy, Corinthians, etc. ), I’d like to do the first one prior to subsequent ones. So, let’s hear it. Which book of the Bible would you like to study on Wednesday’s Word? Comment below or head on over to Facebook and comment. The word of the Lord that came to Zephaniah the son of Cushi, son of Gedaliah, son of Amariah, son of Hezekiah, in the days of Josiah the son of Amon, king of Judah. 7 Be silent before the Lord God! a loud crash from the hills. 11 Wail, O inhabitants of the Mortar! all who weigh out silver are cut off. and their houses laid waste. and against the lofty battlements. he will make of all the inhabitants of the earth. 1. Who wrote the book of Zephaniah? Which genre of biblical literature is this book? Who was the intended audience of the book? What is the theme or purposed of this book? 2. What is the theme of Zephaniah 1? Which aspect of God’s character does this chapter showcase? Sometimes people think of God as wrathful in the Old Testment and loving in the New Testament. Is this true? How can God be good, loving, and wrathful all at the same time? How does God’s wrath demonstrate His goodness? 3. During which king’s reign did Zephaniah prophesy? (1) What impact might his prophecy have had on the king, and, through the king’s actions, on the people? 4. What is the sin the priests are committing in verses 4-6? Verse 5 says the priests “bow down and swear to the Lord.” Who else does it say they bow and swear to? Why would this anger God? Which Scriptures are the priests violating? 5. How do verses 14-18 describe the “great day of the Lord” (the day of judgment)? List the descriptors following the phrase “a day of…” in verses 15-16. Why will God bring judgment on the earth? (17) Why do Christians not need to fear God’s judgment and wrath against sin? 2 Beloved, I pray that all may go well with you and that you may be in good health, as it goes well with your soul. 3 For I rejoiced greatly when the brothers came and testified to your truth, as indeed you are walking in the truth. 4 I have no greater joy than to hear that my children are walking in the truth. 5 Beloved, it is a faithful thing you do in all your efforts for these brothers, strangers as they are, 6 who testified to your love before the church. You will do well to send them on their journey in a mannerworthy of God. 7 For they have gone out for the sake of the name, accepting nothing from the Gentiles.8 Therefore we ought to support people like these, that we may be fellow workers for the truth. 9 I have written something to the church, but Diotrephes, who likes to put himself first, does not acknowledge our authority. 10 So if I come, I will bring up what he is doing, talking wicked nonsense against us. And not content with that, he refuses to welcome the brothers, and also stops those who want to and puts them out of the church. 11 Beloved, do not imitate evil but imitate good. Whoever does good is from God; whoever does evil has not seen God. 12 Demetrius has received a good testimony from everyone, and from the truth itself. We also add our testimony, and you know that our testimony is true. 13 I had much to write to you, but I would rather not write with pen and ink. 14 I hope to see you soon, and we will talk face to face. 15 Peace be to you. The friends greet you. Greet the friends, each by name. 1. Who wrote 3 John? To whom was 3 John written? (1) What was the purpose of this epistle? 2. How many times is the word “truth” used in this passage? What truth is John talking about? Who are John’s “children” (4) who are walking in the truth? What do the terms “my children” (4) and “beloved” (2,5,11) indicate about John’s relationship with Gaius and the church? 4. Word of Faith (prosperity gospel) leaders often like to quote verse 2 from the King James Version as evidence that God wants all Christians to be “prosperous” (wealthy and successful). Examine the KJV alongside these other reliable translations. Is that what this verse is saying? Even if John did mean wealth and success, to whom was this passage written? (1) In context, is this a promise to all Christians in general, or a simple salutation to a particular person? 5. What can we learn about Christian hospitality and caring for those who make their living proclaiming the gospel from verses 5-10? Compare verse 8 with 1 Corinthians 9:14. How do verse 8 and 2 John 10-11 relate to one another? Can you think of a situation in which you might be able to extend hospitality to someone in Christian ministry? An oracle concerning Nineveh. The book of the vision of Nahum of Elkosh. and keeps wrath for his enemies. and the Lord will by no means clear the guilty. the bloom of Lebanon withers. the world and all who dwell in it. 6 Who can stand before his indignation? and the rocks are broken into pieces by him. he knows those who take refuge in him. and will pursue his enemies into darkness. 9 What do you plot against the Lord? they are consumed like stubble fully dried. they will be cut down and pass away. 1. Which genre of biblical literature (epistle, wisdom, prophecy, historical narrative, etc.) is the book of Nahum? The theme of Nahum is God’s judgment against which people? (1) Which book of the Bible would you read to find out more about God’s dealings with Nineveh? 3. Verses 1-3a and 6 highlight which attribute of God’s nature? Verses 3b-5 showcase His power over what? What emotion and response are these verses designed to evoke from the enemies of God? From God’s people, Judah? How can it be a comfort to Christians to know that God will one day judge His enemies? 4. What does verse 7 say about the nature and character of God? Does this contradict the previous six verses showcasing His wrath and power? Why not? How can God be simultaneously good and wrathful? Would it be right to say that God’s wrath against sin demonstrates His goodness? 5. Compare verse 3 to Jonah 3 and 2 Peter 3:9. What do all of these passages teach us about God’s patience towards sinners and His desire for them to repent? Is God’s patience ever an excuse to put off salvation or obedience to Him? like the mire of the streets. 11 A day for the building of your walls! from sea to sea and from mountain to mountain. I will show them marvelous things. for the remnant of his inheritance? he will tread our iniquities underfoot. 1. Who wrote the book of Micah? (1:1) What is the purpose or theme of the book? Which literary genre (historical narrative, wisdom, epistle, prophecy, etc.) is the book of Micah? 2. In verses 1-6, as Micah recounts the woes of his society, how would you characterize his outlook (hope, anger, joy, zeal, etc.)? What are some of the specific problems Micah lists in this section? What are some specific problems you see in the church and/or society that might leave you with feelings of hopelessness and despair? 3. How does verse 7 serve as a pivot point in this chapter? To whom does Micah turn as the solution? (7-8) List the attributes of God and actions He will take that are discussed in verses 7-9. Take a moment to pray about the problems you listed in #2, thanking God that He is the solution, hope, and salvation in each of them. 4. What are some names, places, and incidents in this chapter that remind us that it was written to and for a specific people (Judah) about their unique situation? Examine verses 11-17, 20. Knowing that these specific details were for Judah, what are some general biblical principles we can glean from this passage that apply to Christians today? Can you think of New Testament verses that support these principles? 5. What do verses 7-9 and 18-19 teach us about sin, repentance, God’s mercy, forgiveness and salvation? How do they point ahead to Christ as our ultimate forgiveness and salvation? Then the word of the Lord came to Jonah the second time, saying, 2 “Arise, go to Nineveh, that great city, and call out against it the message that I tell you.” 3 So Jonah arose and went to Nineveh, according to the word of the Lord. Now Nineveh was an exceedingly great city, three days’ journey in breadth. 4 Jonah began to go into the city, going a day’s journey. And he called out, “Yet forty days, and Nineveh shall be overthrown!” 5 And the people of Nineveh believed God. They called for a fast and put on sackcloth, from the greatest of them to the least of them. 10 When God saw what they did, how they turned from their evil way, God relented of the disaster that he had said he would do to them, and he did not do it. 1. Jonah is officially considered a book of prophecy, but what other category of biblical literature (apocalyptic, epistle, wisdom, historical narrative, etc.) does it seem to fit into? What is the theme or purpose of the book of Jonah? Who are the main characters? 3. What was Jonah’s message to Ninevah? (4) Who were first to hear and respond to Jonah’s message, the people or the king? (5-6) Who initiated the fasting, sackcloth, and repentance? (5-6) Whom does verse 5 say the people believed? 4. What does verse 9 seem to indicate was the king’s primary motive for repentance, at least initially- avoiding the consequences of sin, or sorrow that he and his people had grieved God? Compare the king’s words with these passages. Explain the Bible’s emphasis on repentance from the heart. 5. In what ways does Jonah prefigure Christ? How was Jonah’s ministry in this passage similar to Jesus’ ministry? Compare the people they preached to and the message they preached. How does the mercy God showed the Ninevites (10) point ahead to His mercy toward us, through the cross, when we repent and place our faith in Christ? Jonah is a fantastic little book. If you’d like to check out my 12 lesson, on line study of Jonah, click here.